Here’s an interesting concept. Cotton candy machines have been around for who knows how long, but they have never been popular at home because you have to buy the specialty mix in order to make it. Well I’m here to tell you that’s so 20th century. Now-a-days you can make cotton candy from any hard candy you have laying around the house… or your office desk. The Ame no Wataame (Cotton Candy from Candy) will take just about any hard candy, even if it’s sugar free, and turn it into the fibery goodness that you so yearn for. 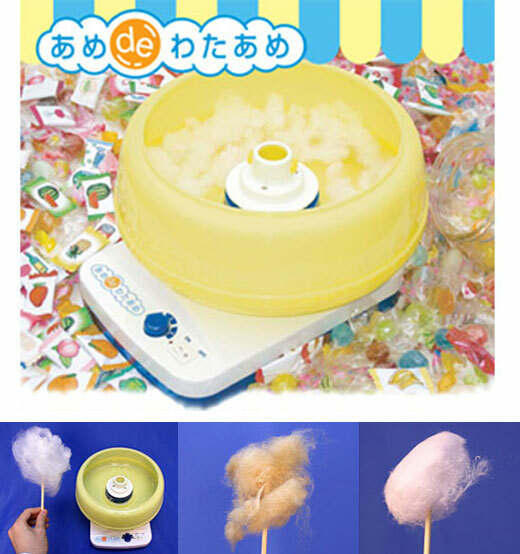 All you have to do is drop the candy into the top loader, turn a lever that drops it into the heater, and then just using a stick (preferably hashi) to extract your cotton candy. This marvel of innovation doesn’t come cheap though. It will set you back $179. But that’s a small price to pay for homemade Jolly Rancher cotton candy.